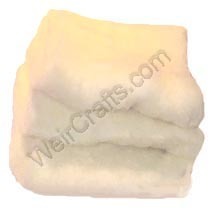 NOTE: these wools are bulky and expensive to ship. Shipping will be charged at actual rate plus $2.00 handling, which may exceed the automated amount in the shopping cart. We will contact you if additional shipping costs are more than $3.00. Thank you for understanding! A 12 or 16 inch doll will need a half pound of wool, a 20 inch doll will require a pound. Clean, combed carded wool, for stuffing toys and dolls. A little more 'sheepy' smell than the Bio wool above.